After a steep selloff in September, DocuSign stock saw another month of double-digit declines. 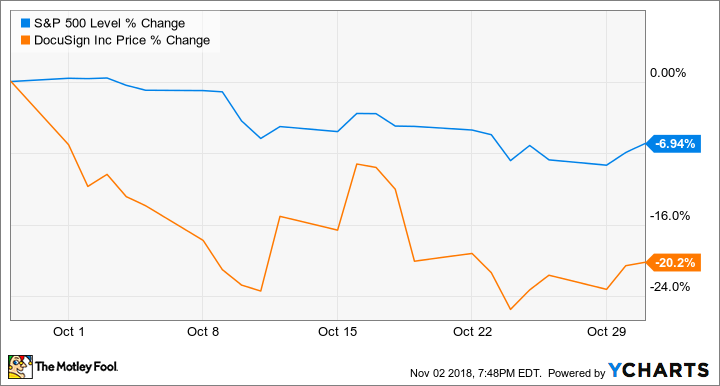 Shares of DocuSign (NASDAQ:DOCU) dipped 20.2% in October, according to data provided by S&P Global Market Intelligence. 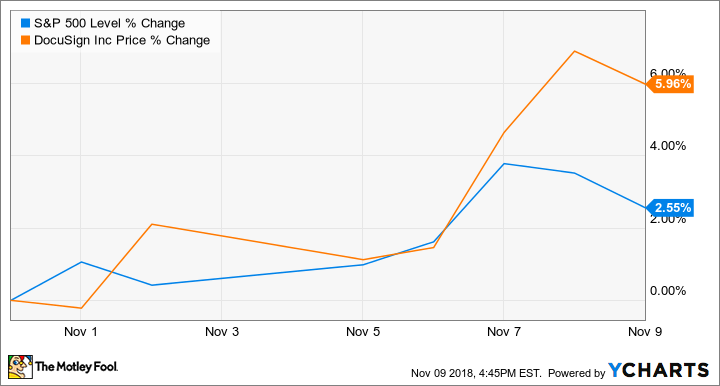 Docusign is a growth-dependent tech stock that saw big gains following its initial public offering in April, so shares pulling back amid a contraction for the broader market is somewhat to be expected. The stock also saw a double-digit price decline in September, following second-quarter results that left investors underwhelmed. But it's still up roughly 12% from market close on its first day of trading. While the rollout does not appear to have had a significant positive impact on the company's stock performance last month, DocuSign did launch a trial version of a service for signing and verifying home mortgage deals. DocuSign Rooms for Real Estate is expected to go into full release next spring, and will offer both partially digital and fully digital solutions for mortgage-document delivery and signings. DocuSign is a leader in its niche, and has a large addressable market and impressive gross margin. It has avenues to becoming consistently profitable and expanding earnings, as it grows its customer base and adds new services. However, it could still face pricing pressure from competitors, and investors should proceed with the understanding that its offerings could be replicated by larger tech platforms. The company's third quarter wrapped at the end of October, and management expects to report sales between $172 million and $175 million for the period. Full-year sales are expected to come in between $683 million and $688 million, with bookings coming in between $732 million and $752 million. Currently, shares trade at roughly 10 times this year's expected sales.